Wolfgang Auto Bathe is pure luxury for your vehicle! Wolfgang Auto Bathe will please even the most discriminating auto enthusiast. Wolfgang’s research and development team began with the idea of a state-of-the-art car wash that would be natural and gentle, yet very effective, making the most of cutting-edge research and development in non-toxic, biodegradable cleansers. We’re pleased to say that, not only does Auto Bathe live up to that notion, but it surpasses other car washes in cleansing power and preservation of your vehicle’s paint. Thanks to technological advances stemming from years and years of German research, input from professional detailers, auto paint and finish technicians, our team of American chemists were wildly successful in formulating an advanced car shampoo unlike anything else on the market. 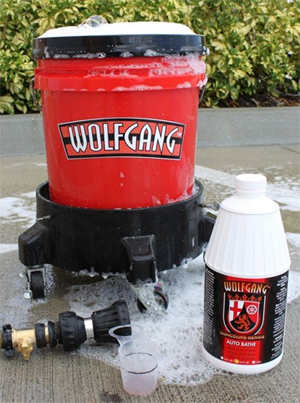 The secret behind Wolfgang Auto Bathe’s awesome cleansing power is in the suds. TUFF SUDS II is a foaming technology that works by suspending natural oils and what we’ve dubbed “super polymers” within the foam—allowing built-up dirt and grime to be effortlessly swiped away. The natural oils act as lubricants, encapsulating each dirt particle, reducing the chances of washing swirls. Gritty and abrasive residue is rinsed away without scratching the paint. Wolfgang Auto Bathe is highly concentrated and produces a rich lather. We at Wolfgang set the bar high when it comes to environmental matters. We’re committed to our products being earth-friendly. With a perfect, neutral pH balance of seven, Wolfgang Auto Bathe is completely safe for your skin and the environment. You won’t find any harsh detergents, dangerous toxins, wax stripping agents, or sub-quality ingredients in our Auto Bathe—or in any of our products. Dry vehicle with a soft microfiber waffle-weave drying towel. Click here to read Mike Phillips' review of Wolfgang Auto Bathe. Wolfgang Auto Bathe 128 oz. Free Bonus! Wolfgang Hat - FREE With Wolfgang Orders over $75!Wolfgang Car Care KitsWolfgang Füzion Carnauba Polymer Estate Wax 3 oz. Mini Wolfgang Füzion Estate Wax Mini Connoisseur’s Kit Wolfgang Füzion Carnauba Polymer Estate WaxWolfgang Füzion Estate Wax Connoisseur’s KitWolfgang™ Plastic Headlight Lens Cleaning SystemWolfgang Deluxe Plastic Headlight Lens Cleaning KitWolfgang Deep Gloss Paint SealantWolfgang Perfekt Finish Paint PrepWolfgang Uber Ceramic CoatingWolfgang Fuzion Spray WaxWolfgang Fuzion Connoisseur’s Choice Wax KitWolfgang Deep Gloss Liquid Seal 8 oz.Wolfgang Uber Wash & WaxWolfgang Paintwork Polish EnhancerWolfgang Uber All In OneWolfgang Uber Compound 3.0 8 oz.Wolfgang Total Swirl Remover 3.0 8 oz.Wolfgang Finishing Glaze 3.0 8 oz. t found a reason to try anything else. ConsCosts more than the usual shampoos but well worth the price. I may part of the minority judging by other reviews, but I don't see anything special about this product. It didnt really seemed like there was much lubricity in it. I think I'll stick my Meguiars Gold Class wash for a fraction of the price. My first bottle of auto bathe I got was part of a kit, I liked it because it does away with those bothersome water spots. I used 2oz in my 5 gallon bucket to clean away a winter storm and about 2 weeks of salt and grime from the past few winter storms that I was forced to drive through. The car was a severe mess and today was my first time using a Wolfgang product. Compared to Meguiar's Gold Class, I would much prefer to use Wolfgang Auto Bathe. I'm going to put Ultimate Wash & Wax up next to it and decide from there but I'm impressed. ProsScent, suds, lubricity and enriching oils. Suds stick to the car and don't disappear so you don't have to rush and rinse. ConsCost and value, compared to Meguiar's Ultimate Wash & Wax it's hard to pay the same price for half the product.